Most common contact with foreign exchange occurs when we travel or buy things in other countries. Suppose a U.S. tourist travelling in London wants to buy a sweater. Price tag is 100 pounds (Symbol for pounds: £). For businesses or governments that trade billions of dollars, even small changes in the exchange rate become significant. When the United States dollar (symbol: USD) becomes stronger, then foreign goods and services become cheaper, and goods and services from the United States will become more expensive. Consequently, imports to the United States will increase and exports will decrease. When the dollar becomes weaker with respect to other currencies, then the opposite happens: goods and services from the United States become cheaper, thereby increasing exports, and foreign goods and services will become more expensive, thereby lessening imports. Thus, the trade balance of any country is largely determined by the value of the domestic currency in relation to other currencies. It would seem logical that if the dollar, for instance, weakens, the U.S. trade balance will improve, as exports would rise and imports would decrease. However, the U.S. trade balance usually worsens for a few months. of a country and the improvement in its trade balance. Exchange rates are an important consideration when making international investment decisions. The money invested overseas incurs an exchange rate risk. Affects the prices of imported goods. Affects the overall level of price and wage inflation. Will influence consumers’ buying decisions and investors’ long-term commitments. And government and central bank monetary policies among others. At the heart of this complex market are the same forces of demand and supply that determine the prices of goods and services in any free market. If at any given rate, the demand for a currency is greater than its supply, its price will rise. If supply exceeds demand, the price will fall. The supply of a nation’s currency is influenced by that nation’s monetary authority, which is usually its central bank. Government and central banks closely monitor economic activity to keep money supply at a level appropriate to achieve their economic goals. Too much money increases inflation, causing the value of the currency to decline and prices to rise; whereas too little money can slow economic growth and possibly cause rising unemployment. Monetary authorities must decide whether economic conditions call for a larger or smaller increase in the money supply. News of political instability in other countries drives up demand for U.S. dollars as investors are looking for a safe haven for their money. A country’s interest rates rise and its currency appreciates as foreign investors seek higher returns than they can get in their own countries. Developing nations undertaking successful economic reforms may experience currency appreciation as foreign investors seek new opportunities. There are some who believe that some currency exchange rates are not what they should be. For instance, there is a bill in Congress to correct any fundamental exchange rate misalignment, a bill which is actually aimed at China because Congress believes that the Chinese yuan is seriously undervalued against the United States dollar. But how does one ascertain the misalignment of currency rates? Is there a true exchange rate and can it be determined? There are at least 3 methods that purport to reveal the true exchange rate, or to at least reveal misalignments. One common method is purchasing power parity (PPP), which is the common assumption that the amount of currency needed to purchase a specified basket of goods should be equal to any other currency needed to buy that same basket of goods. However, this measure disregards the effects of comparative advantage, which is the advantage that some countries have over others in producing a particular product because of location or other factors. Moreover, purchasing power parity is difficult to measure, although the Economist magazine publishes a Big Mac Index, which is the price, in local currencies, to buy a Big Mac hamburger at the many McDonald's restaurants located throughout the world, and compares this to the United States dollar (USD). The Big Mac Index shows what the implied PPP is in USD, which is equal to the price in local currency divided by the price in the United States, and compares this to what the actual exchange rate is. None of the exchange rates shown in the latest index shows purchasing power parity, although some come close, which could simply be a coincidence. Nonetheless, there are more sophisticated models that purport to give a truer picture of PPP by accounting for differences in productivity or income. However, purchasing power parity does not account for international capital flow, which is far more important in determining exchange rates. For instance, countries with investments that yield the highest return will have large inflows of foreign capital, which will certainly have an impact on exchange rates, but capital flows are not related to PPP. Another method to calculate what the exchange rate should be is the fundamental equilibrium exchange rate (FEER), which is based on a sustainable current-account balance and internal balance, with low inflation and full employment. A sustainable current-account balance is predicated on the simple fact that a country cannot continue accumulating more and more of a single currency unless it is actively intervening to keep the exchange rate low. Thus, China's continually growing current-account surplus of United States dollars is given as evidence that the yuan is seriously undervalued. However, a large current-account surplus may result because the people of a country invest more in foreign countries, or because the country has a low interest rate. A good example of why the current-account balance could be misleading is to examine why the Japanese yen is low compared to other currencies. The current interest rate in Japan is about 0.5%, the lowest of the developed countries. Because the interest rate is so low, and much higher elsewhere, many Japanese investors invest their money outside of their country, but to do so, they must exchange Japanese yen for other currencies. Another factor is the carry trade, where investors all over the world borrow yen at the low interest rate, and convert it into currencies where interest rates are higher, such as in New Zealand, which currently has an interest rate of 8%. Then there is the behavioral equilibrium exchange rate, which is predicated on the invariance of cause and effect, so what economic variables influenced currency exchange rates in the past, such as productivity growth or net foreign assets, will also influence future currency exchange rates. While this seems plausible, how does one determine that a particular set of variables and their relative importance determined the exchange rate in the past? Will the importance of each economic variable change when other variables change, and if so, how? The study of a single economic unit, which may be a firm, a household, or an organization. The interaction of all of these units is the purview of macroeconomics. Swapping 1 forex contract for another with a later delivery date, which is usually done because the trader who agreed to the contract, does not actually want the delivery of the currency, but simply wants to trade for profit. While there are many theories about what actually sets the foreign exchange rate, there is a simple way to visualize the true determiner of rates. Keep in mind that banks do most of the actual trading and all of it is done in the over-the-counter market, where 1 bank communicates with other traders, mostly banks to satisfy its currency needs. You may be a forex trader trading with a broker, but that broker trades with banks. Also, most forex trading done by retail traders does not actually involve the transference of currency. The currency contracts are simply rolled over into new contracts before actual delivery takes place. However, if you were a businessperson or a government with a real need to trade actual currency, you would go to a bank to satisfy your needs, because that's what banks do. Now imagine that you owned an international bank in Switzerland. The main currency of Switzerland is the Swiss franc (CHF), but since you are an international bank, you must deal in other currencies as well. Let's take the United States dollar as an example. Some of your customers will want to exchange francs for dollars, and some will want dollars for francs. But how many dollars do you want to keep? You want enough to satisfy your customers' need for dollars plus some reserves for unknown immediate future demands. Now, because an international bank actually needs different currencies to do business, it will keep some of the dollars that it gets from customers so that it can give other customers the dollars that they demand. But what happens when the bank starts getting too many dollars in relation to that bank's customers' demand for dollars. The simple solution is to simply reduce the price of the dollar in terms of Swiss francs. When a customer comes in to exchange dollars for francs, you start giving fewer francs per dollar. This immediately lowers the number of francs that your bank pays for each dollar. Ergo, this lowers the exchange rate of dollars for francs. But suppose you continue to get more dollars than you can use in your local business—maybe because some local exporter has a hot new product that's selling wildly in the United States, so the exporter has no choice but to trade dollars for francs, because he has to pay his workers and suppliers in Swiss francs, since the business is in Switzerland. As an international banker, you know that there are other banks that will have a need for dollars, and so you call them, or communicate with them over an electronic network, such as the Internet, and trade dollars for Swiss francs. You call another bank in another town that happens to have a United States international firm doing business in the town. While the business pays its local workers in francs and receives revenues in francs, it needs to send dollars back home in the United States, so it goes to the local bank to exchange francs for dollars. Because the bank doesn't have enough dollars on hand to satisfy the U.S. business, that bank readily agrees to exchange dollars for francs with your bank. You can also contact banks in New York, some of which, will have a need for more francs than dollars. But you also know that the Swiss government wants to keep the exchange rate of francs for dollars low, so that exports to the United States increase and imports decrease, so you contact the central bank of Switzerland, the Swiss National Bank. To carry out the government's policy of lowering the exchange rate of the franc against the dollar, the central bank agrees to buy your dollars for francs. If there is no other need for the dollars, the central bank simply holds them in reserve to satisfy the Swiss government's desire to lower the exchange rate of francs for dollars. Thus, the exchange rate that your bank sets will be determined by the total demand from your customers and from other banks. But note that this exchange rate will tend to be equal to the rate set by other banks. Why is this necessarily so? Remember, the exchange rate that you set ultimately depends on demand on both your customers and other banks that your bank trades with. If you are offering fewer dollars per franc than other banks because of the excess of supply over demand from your customers, then those banks will buy dollars from your bank until your rates become equal. So this is how demand and supply actually work in the microeconomic view. 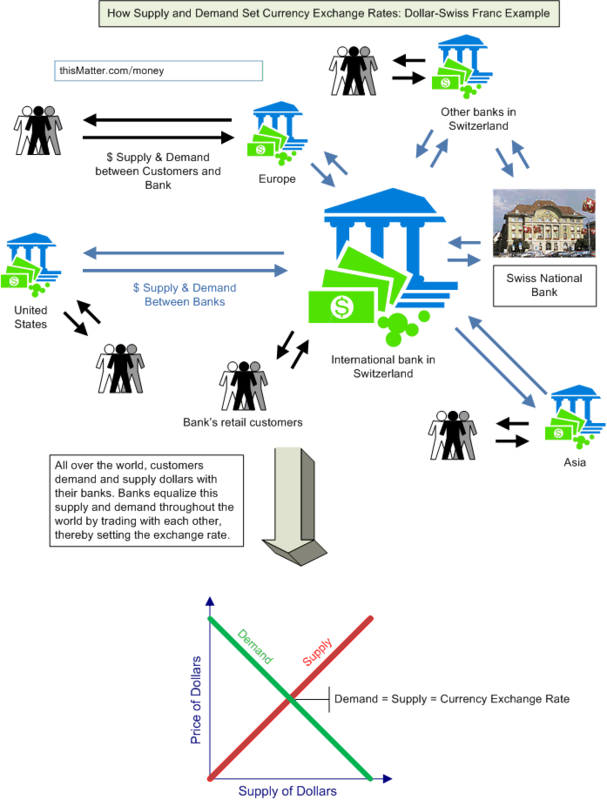 The demand and supply of currency ultimately originates with the people; even when governments set monetary policy through their central banks, it is to satisfy the needs of their residents; banks simply equalize this supply and demand all over the world by trading with each other. In the end, it could be concluded that the true currency exchange rate is what it actually is.